Happy 2013 all! I have been MIA for a bit. I was hit hard by the 2012 Cold & Flu Season. I'm coming back slowly, but surely. I can hardly wait to get caught up with everyone! My hopes are that you are all free from illness! It's tough being sick! Ask me, I know! I have high hopes for 2013 and by the end I hope to have a nice little chunk of funds to CELEBRATE! I am sure that most of you have seen this challenge posted on Facebook. I am participating and wanted to see if you are too. If you aren't familiar with Kassondra's 52 week Money Challenge, please take a moment to watch Kassondra's CW31 Good Day Sacramento interview regarding the Facebook group that she has started. To date there are 3,500+ participants! I decided to do my deposits in reverse to make it much easier in the end! Since my deposits are going into an interest bearing account, I also figure the larger the amount and longer the money is there - the better. EVERY little bit counts right? Honestly, I haven't decided what I will spend the money on. What would you purchase with $1,378.00? Inventory for my online store. That would be a great buy! I have been hearing about this project and it sure looks interesting. Hope you get the amount you are looking for at the end of the year. I actually hadn't seen this before. It sounds like a great plan, and very doable. I'm going to look into it more. Thanks for sharing! Oh i like that I am going to start this next week! We'd pay off some debt, but we are working at it and in the next few weeks will have it paid off to work on paying off the car and house again! What a great feeling! I haven't seen this but I love it! Christmas 2013, here I come! 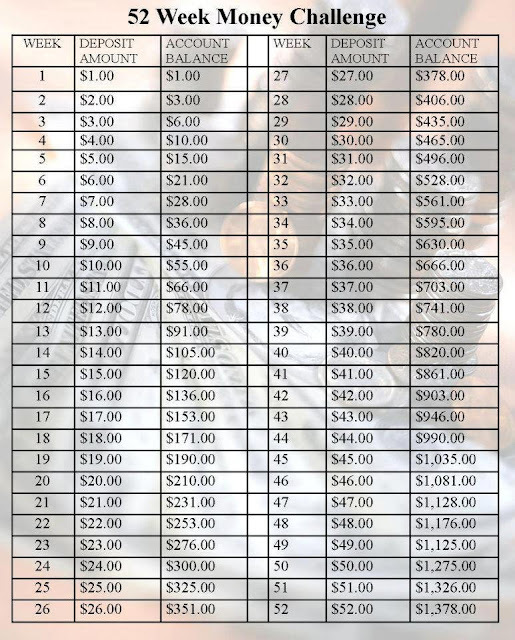 This is a great way to save money. If you do this, you would have a nice sum of money to put towards Christmas presents or have an emergency fund for a rainy day. Love this idea - I was thinking about doing it a little differently though because by the end you are putting away $200 a month which is a huge different from $4 the first month! This is a neat idea for people who don't save at all. I like the idea of reversing it, because around Christmas, people are much less likely to have extra to put in savings. I need to do this. Thanks for sharing! I have seen this around. I want to start it. I think starting from the beginning would be more feasible for us since my husband is laid off right now. Thank you all for taking time to read my post and leaving a comment! I am succeeding at the challenge! The facebook group is great! Everyone is so supportive (as are all of you).